A few years ago Kinko's was bought by FedEx and became FedEx Kinko's. Now the business is simply called FedEx Office. People use FedEx Office to print and copy everything from invitations to business marketing boards. For invitations, FedEx Office has two different ways to bring in your design and get it professionally printed. You can go into one of their locations or to their website to print our your invitations. Create and save your invitation on a compact disc, floppy disc or flash drive. Finalize the design before taking it into the FedEx Office building. 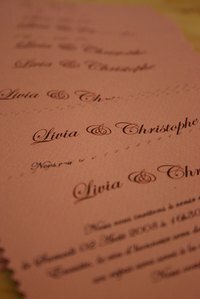 If you already have the paper that you want the invitation printed on, take it with you. Take your disc or flash drive to a customer service representative at FedEx Office and tell her what you want. If you brought your own paper, give it to her. Give her the number of invitations you want printed, the type of paper you want it printed on (if you choose one of their paper types) and any other options for the invitations (two-sided, tissue paper, etc). Have the representative print out a couple of sample invitations while you are still there. This way you can see how they will look after being printed. Check with the representative for when the invitations will be printed and ready. Set a date that is far enough in advance from the actual event so that you can have time to get them reprinted if something goes wrong. Give the representative your contact and payment information. Pick up the invitations on the due date. Check each one of them for consistency and errors. Sometimes different printers can produce slightly different results. If you have a big order and they used several different printers to complete, the design can be off on some of the invitations. Sometimes the changes are so minuscule that you don't really notice the difference. Go to the FedEx Office website. Click on the "Download and install now" button to install the File, Print FedEx Kinko's application. The application makes it easier to customize the settings on your computer so the documents are easier to be printed in professional quality. It also adds the FedEx Kinko's driver as one of your print drivers. Open the invitations on your computer. Print the invitation by clicking on the "Print" icon or "Print" from the menu bar. Select "File Print FedEx Kinko's" as the printer to print to and then click "Print." The FedEx Kinko's application appears. Choose your printing options, including number of copies and any paper options. Choose whether you will like to pick up your invitations from one of the locations or have them shipped to you. If you want it shipped, provide your shipping address and payment information. If you are going to pick the invitations up, choose the location close to your home.